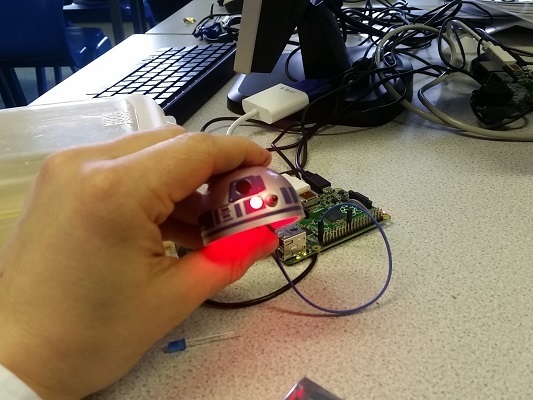 I run a Raspberry Pi lunchtime club for students and they wanted to create a Star Wars hack. A local store was selling R2D2 sweet dispensers for a couple of pounds and I decided to purchase some and see what ideas the students came up with. 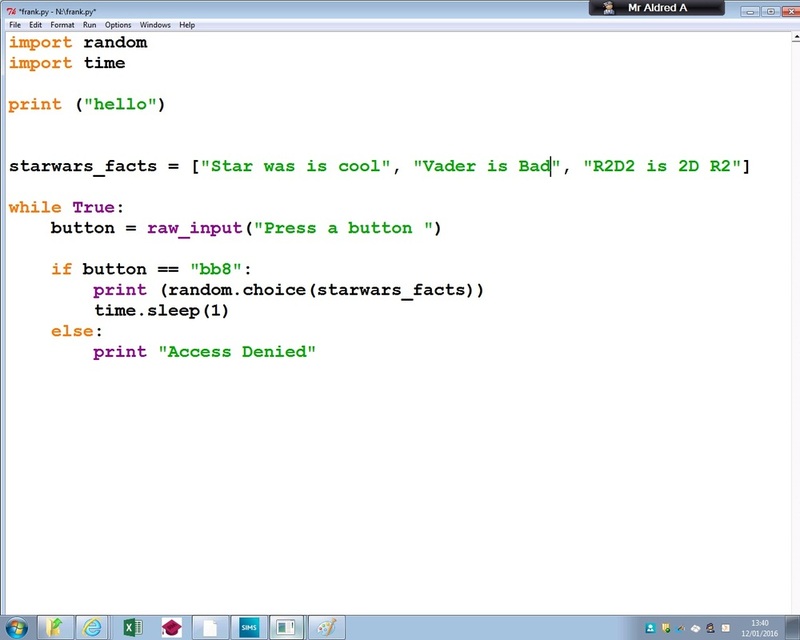 This is the online account of their development of the R2D2 hack. Scroll to bottom for final project video. 1. Prints out random Star Wars Facts - no screen used! 4. 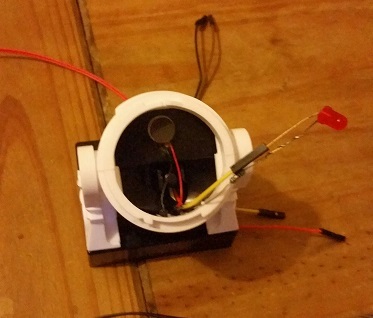 Randomly gives the user a little electric shock, just like R2D2 - simulated! The first step was to create a simple random fact generator using random.choice. The facts will be downloaded from a website or written out by the students from their own knowledge. Using a drill a some delicate pressure we made a whole for the LED to fit through and used the code in step 2 to control it. 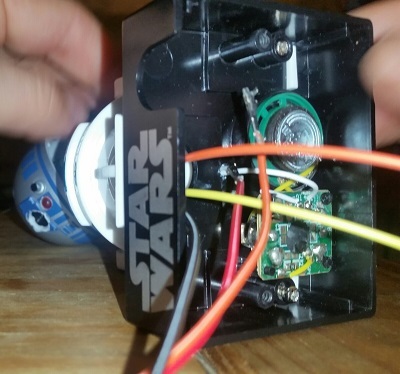 Students wanted to be able to see from R2D2 what the user looked like, who had pressed the button. 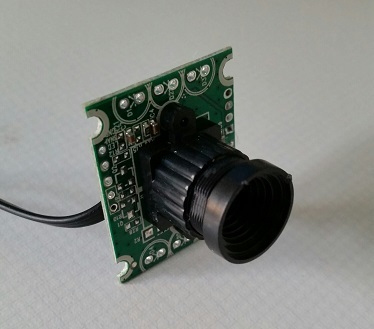 We hacked an old USB Web Cam, drilled a hole in R2's head to place it. The R2D2 responds when the front button is pressed. 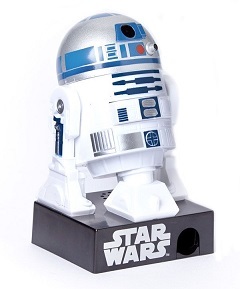 This is the triggers the R2D2 bleeps. The wires were cut and two extension wires added. 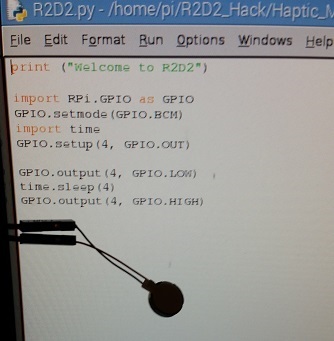 These were joined to the GPIO pins and a code used to check for a Pull Up - a small change in current. 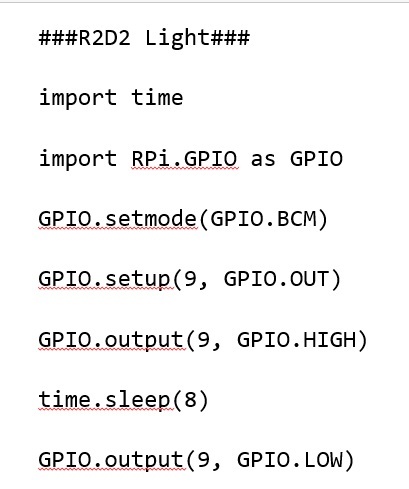 The GPIO Pull Up checks for a change in the state of the current, it basically registers a change and can be used to trigger an event. 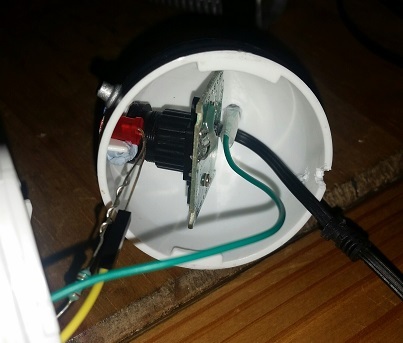 When the main R2D2 button is pressed the GPIO change is registered and then this triggers the code the enable the LED or a Haptic Motor to start. Despite the one students wish to enable R2D2 to electrocute people I felt it was not the best thing to do! 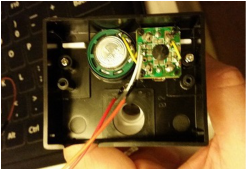 Instead we settled on a Haptic Motor which could be used to vibrate the R2D2 case and may 'shock' the person who pressed the button. The students wanted to broadcast the facts over a Radio, this makes use of PiFM, which ironically has the Star Wars them install! 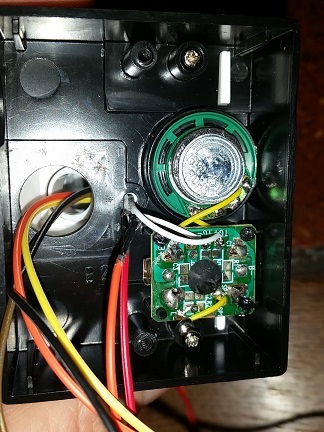 It works on a single pin but testing is required to ensure that it works with all the other wires connected.